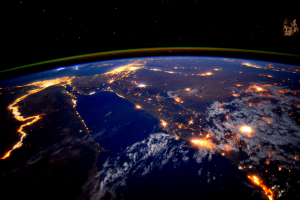 NASA astronaut Scott Kelly, recently past the halfway mark of his one-year mission to the International Space Station, photographed the Nile River during a nighttime flyover on Sept. 22, 2015. Kelly (@StationCDRKelly) wrote, "Day 179. The #Nile at night is a beautiful sight for these sore eyes. Good night from @space_station! #YearInSpace.